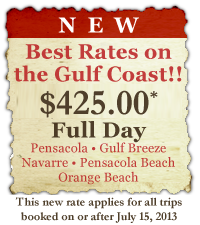 The Best Rate on the Gulf Coast!! $450 (1-2 anglers) for 5 hours!! $25 for each additional angler to 4. All rods and reels, FL fishing license included, tackle, baits, ice, bottled water and Patagonia all-weather gear. Redfish University uses only artificial baits on inshore fishing trips. Redfish University uses the highest quality saltwater equipment. Current year Penn Clash, Battle II and Conflict 2000-4000 spinning reels and Abu Garcia Inshore Revo baitcasters. Current year Penn Battalion, Regiment, Battle II and Legion 7’0 rods. Spiderwire Ultracast InvisiBraid and Spiderwire Stealth Camo Superlines. All foul weather gear is provided by Patagonia.